Gene was one of the bands that came out round the time of Britpop. Love their work. Martin Rossiter was in that lovely purple Morrissey/Oscar Wilde vein. but i’m left wanting more. 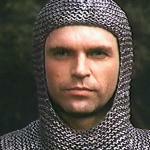 It is a worry, but the supreme beacon of all that is enticingly masculine is Sam Neill as Brian de bois Guilbert in “Ivanhoe”. The lovely Anthony Andrews is a fine Ivanhoe, but the bad boy Brian is brooding and looks wonderful in chain mail. His penchant for tying up girlfriends and setting them on fire is less pleasing. Especially considering my heroine Rebecca is Olivia Hussey. If I could choose to look like anyone, I would have a tough time deciding between her or Audrey Hepburn. BTW, Ciaran Hinds as Brian in tv version is also one hot tamale.